He takes me to a counter in front of a large kitchen open to viewing by the diners. 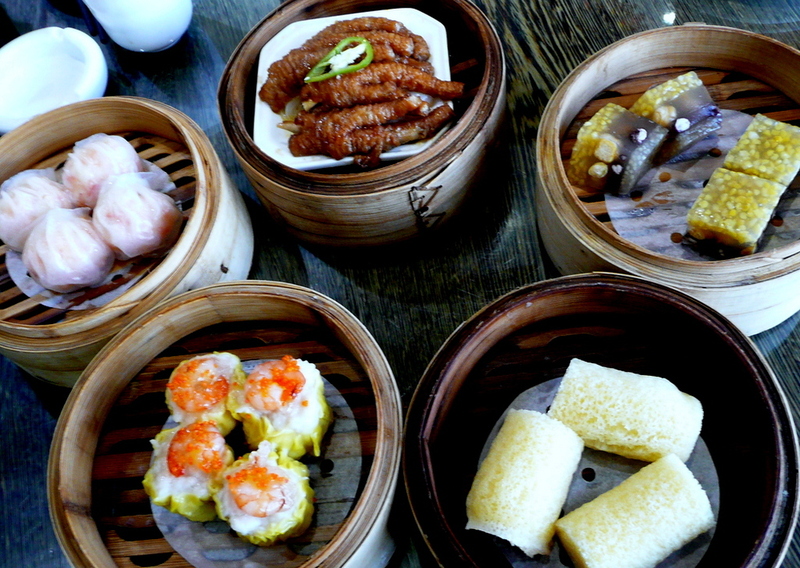 Here we find stacks of small, individual bamboo steamers already made up with a variety of dim sum. We choose Gold sponge cake rolls Huang jian juan, andHealth Zha liang gao, layers of rubbery aspic—probably rice based—first layer with sesame seeds, second layer with red beans, third layer plain, top layer with millet, the whole thing cut into bite sized cubes. Also Jiǎozi Xiā jiǎo, steamed shrimp dumplings with a hint of sesame wrapped in a thin rice wrapper; Xie zhai shao mai wang golden yellow pouches of pork filling topped with shrimp and sprinkled with orange roe; Ma xiang jian xia bing fried medallions like a miniature shrimp stuffed crepe. For the men there is Phoenix Talons Chicken Feet Fung Jao. When the last delicious morsel is consumed with numerous pots of tea, and a small pile of clean chicken bones is all that is left, it's time to drive across a wide boulevard to an immense bonsai marketplace we can see from our upstairs dining room. and moving the heavy trees in or out of place, carefully wrapped and supported with numerous guy wires. one massive, double root Chinese black pine Ma wei shong estimated to value RMB 1 million or $163,000. This style of large penjing is called jing guan shu. Notice the medium-sized bonsai used as an accent ying on my right side. We cross two bridges. Vendors import trees from Taiwan and Japan to sell in China as well as exporting Chinese trees back the other way. We pass pottery vendors and cross another bridge. We turn and cross another bridge, driving beside a canal on one side with more retail nurseries on both sides. Another bridge is crossed and we turn, driving past large landscape trees: palms of several varieties, a deciduous tree xiao yue lan ren. The nurseries show great quantities of podocarpus, willow, cyad, tea trees and baobao trees from Africa to name a few I recognize as we pass. We cross another wide and busy boulevard, still inside Hua Hui Shi Jie. I can see shade structures set back from the road and flats of blooming plants and pavilions of expensive pots and rare stands kept indoors. There are 500 retail garden establishments. The Hua Hui Shi Jie comprises 3.5000l 2km (1.35 2 miles) with another area separate from this one for storage comprising 21.5000 2km (8.32 miles). I am privileged to meet Director Xie KEYING, Chinese Penjing craftsman, Chinese Penjing Artists Association Vice President and Guangdong Province Penjing Association Routine Vice Chairman, Secretary General at his private residence inside the Hua Hui Shi Jie where he lives with his family. In a sitting room surrounded by art-- bronze and ceramic sculptures, rare ceramics, family photos and rock penjing-- and overlooking an exquisite terrace and water feature several acres in size or more than an hectare, I'm introduced to the movers and shakers of the BCI, Master KEYING and Master JI Jia along with Master CHEN, all board members and good friends. There will be more about this interview in upcoming articles. I was pleasantly surprised to see the picture of Mr. HU Yun Hua, director of the Shanghai Botanic Garden, listed first in the membership roll of the BCI. I interviewed Mr. HU in 2011. 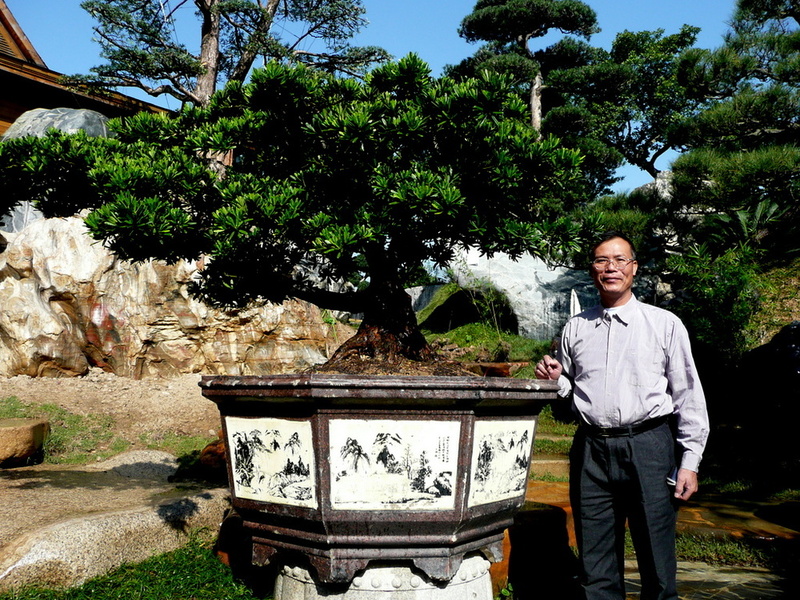 You can find the article Shanghai bonsai treasures here . Also here Chinese Penjing, Styles and Culture. A short drive brings us to a grand hotel where we enjoy another fabulous meal. Canton goose Guangdong shao er, crab, dofu with braised lettuce, green vegetable and poached, scrambled egg with black mógū蘑菇 and lettuce. Alan and I split a bottle of local Pearl River beer, yī píng píjiǔ hé liǎng bēi. After lunch we bid adieu to Master KEYING, climb into Master CHEN's Honda and drive to our last location. 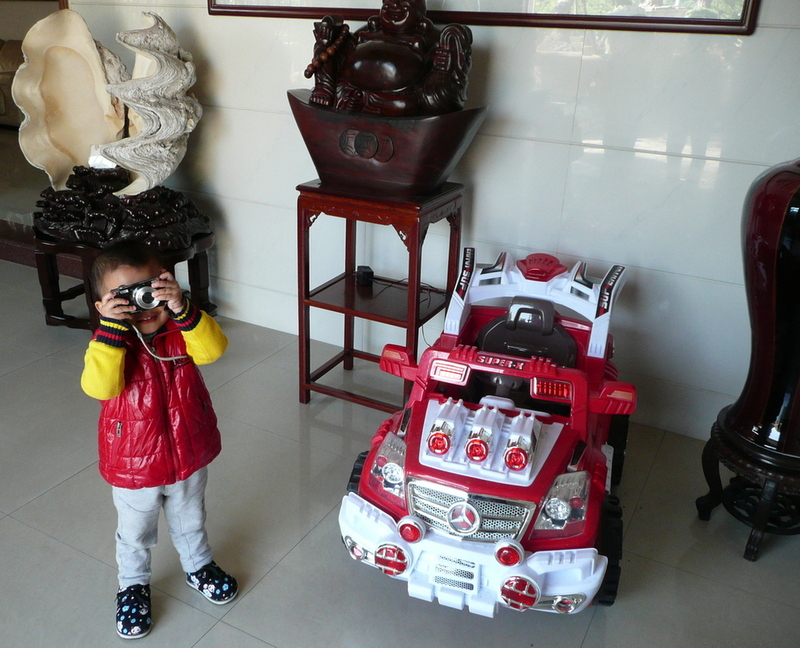 Master JI Jia's modest, by comparison, nursery is crammed with trees growing in all stages. He has many medium-sized trees destined for Japanese export. His background is the Navy. His trajectory from the 70s to 80s is not dissimilar to the others, sailor to factory worker. In 1983, when China opened to the world, he was working for a national ministry petroleum company. This was when, in 1983, he began his own penjing garden. Unlike some collectors, he does his own trees. In fact, Master JI has received numerous awards which are stacked like cord wood in red velvet cases in his small office. Has been exhibiting only for the past three years. His motivation to exhibit is love of penjing as well as promoting his his business so that his two sons, 25 and 32 years old, will be able to follow him. Lastly he wants to promote the tradition of penjing which he learned from his old master, Laoshi LU Xie Ming, the originator of the Yingnan style. This group, headquartered in Guangzhou, is one of the premiere organizations for bonsai in the world with an exclusive by invitation only membership to those recognized for their promotion of penjing and for their skill. They sponsor a bonsai exhibition every May and October. Here's their official link and also a link to their Facebook page. The BCI committee in the US organizes a delegation to the exhibitions. About 200 people attend from all over southeast Asia: Korea, Japan, Italy, Singapore, Vietnam and India. Judges come from all around China, Taiwan and Japan, either seven, nine or eleven judges. The judging criteria are simple but crucial: roots, branches, suitable pot, rocks and small decorations penjing peijian. The judges rely on their personal aesthetic and their background in understanding the different regional styles. 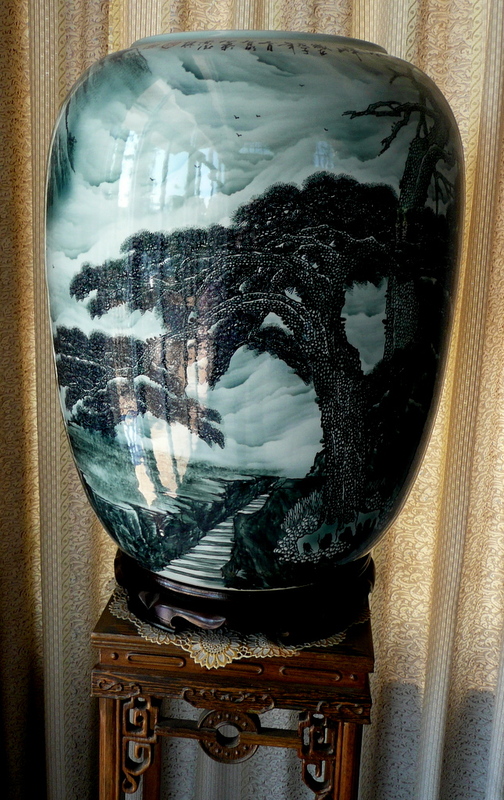 They imagine what inspired the penjing craftsman to make this particular tree. 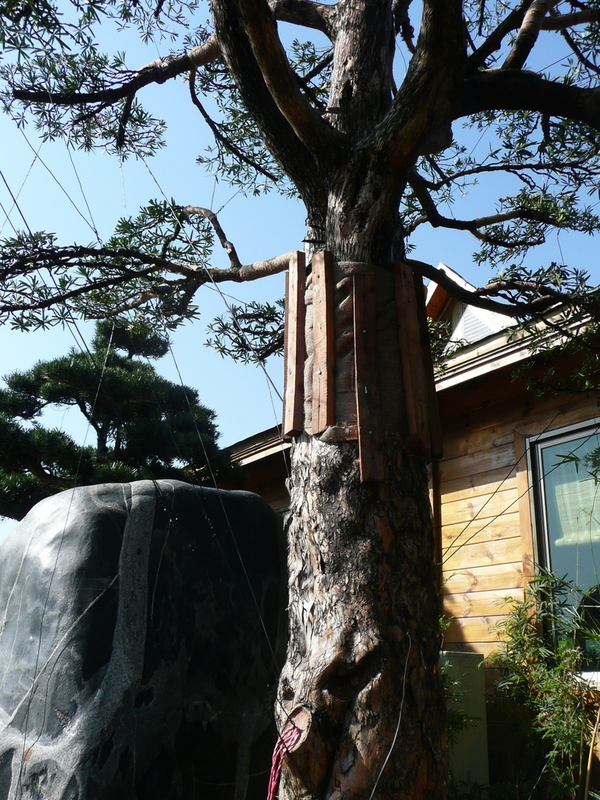 I hope you have enjoyed this two-blog romp through the world of bonsai/penjing. :) I plan to write a new series of articles for the European publication Bonsai Focusas well as Golden Statements,the magazine of the Golden State Bonsai Federation about the local Yingnan style. Japan in 2009 with Bill Valavanis and Kora Dalager at my original Window Box Nursery site. Master CHEN drops off Alan and me near a metro entrance on the outskirts of Guangzhou. We hurriedly say goodbye, and I tear myself away from the charismatic master and my immersion into his life. Saying goodbye to Alan at my budget, businessman's hotel in downtown is another wrenching experience. He helps me make my next transit reservation before we walk out of the hotel together, parting at the entrance of an anmo or massage clinic around the corner. I watch him thread through the crowd toward the metro entrance where he will connect with a train to Shenzhen where he lives. I turn into the hotel lobby and look for the clinic and my next adventure.